Midwestern Tennis Association (“MID-TAC”) is partnering with the Bollettieri Tennis and Learning (“BTL”) program to provide support to existing urban junior tennis programs. The support will take on different forms based on the needs and makeup of the Midwest Junior Tennis Organization’s completed and approved “required” Inquiry Sheet*. All programming and services will be provided at no cost to the qualified junior tennis program and includes a path to college scholarship opportunities in the long term. On-site skills training [academic tutoring, life skills coaching, and fitness training] by BTL Staff for the use of junior players on the gettuf.com platform. Each junior will have their own personal account, paid for by BTL. On-site coaches clinic conducted by BTL Staff for coaching tips at no cost to the Midwest junior tennis program. Access and training on the use of tennislockerapp.com the delivery of tennis programs and assistance with fitness. To help Midwest junior tennis programs to apply for and gain more funding for programming and expansion. Provide various tennis equipment via BTL’s industry partners. 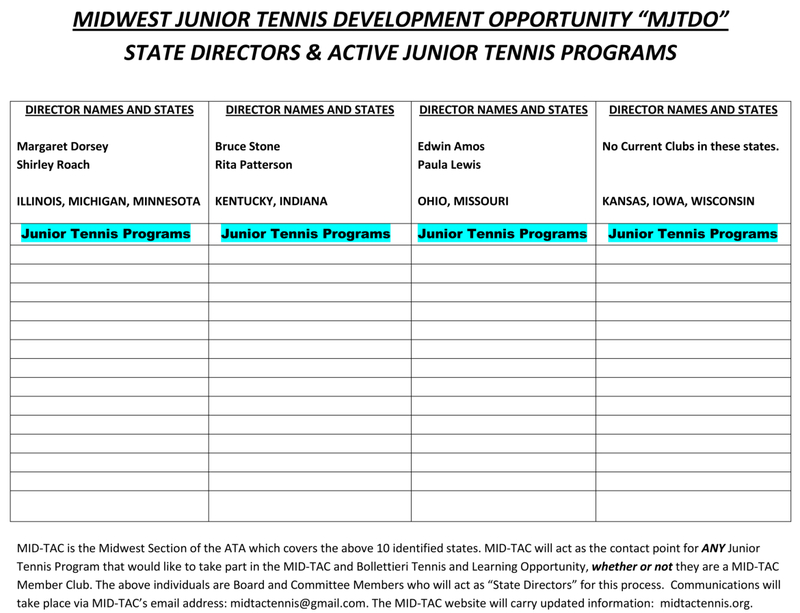 Use the PDF viewer to read/download and/or print the MIDWEST JUNIOR TENNIS DEVELOPMENT OPPORTUNITY INQUIRY SHEET. Click FULL SCREEN to view in full screen. Use the PRINTER ICON on the viewer’s TOP RIGHT to print. Use the DOWNLOAD ICON on the viewer’s TOP RIGHT to download the application to your computer or device. If you’re viewing this page on a MOBILE DEVICE, click the THREE SMALL DOTS on the top right of the viewer to reveal the menu for the PRINT and DOWNLOAD options. MID-TAC is a 501(c)3 organization and the Midwest Section of the American Tennis Association (“ATA” founded in 1916).